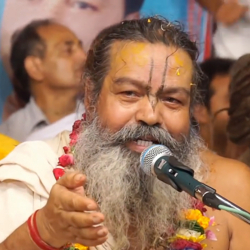 Shrila Vinod Bihari Das babaji is a Gaudiya-vaisnava saint. After blessing various cities of India, babaji finally has taken shelter under the divine service of Radharani in his ashram named Priya-kunj ashram in Peelipokher, Varshana, since 2006. Babaji is the true example of mercy that the Supreme Lord possesses and is sure to be present in the exalted devotees of Lord, like babaji is. If you want to see someone with extraordinary attraction, love, sweetness and yet, extraordinary humbleness, babaji is the true destination. Babaji is someone who will shower an ocean of mercy on you even if he don not know you. Just like Shrimati Radhika, he would not see whether you deserve it or not, he would anyhow love you unconditionally. Babaji is the source of mercy not only for the residents of Shri Varshana dham, but also for the fallen souls all over the world. No one remains who is untouched from his mercy, even the animals... the love babaji showers to monkeys on his way to Shri Ji Mahal is a must to watch event. Everyone is amazed to see how all monkeys respond to babaji, they take tofees and biscuits from his hand as if they are all trained. Yes! they are trained but only under the divine love that babaji showers on them. He says that they are not mere monkeys, they were all exalted devotees who begged to be monkey of Shri Varshana dham and so we must love them. Every evening at Oonchi Atari at Shri Mahal one can recieve great benefit from his satsang on various topics. Babaji presents too difficult concepts of bhakti in such a simple way that anyone can learn from his divine satsang. He would cite things from his deep knowledge of scriptures and then will explain it in the way you can understand easily. Babaji just originates a river of divinity and emotions towards Shri Shri Radha Madhava Sarkar in which everyone can take bath. and many more vaisnava songs. From the unlimited teachings of babaji, his book "Obstacles in Bhakti" is a must-read for any vaisnav who want to live an offenseless spiritual life. For us, it is impossible to explain who babaji is. Words can be just small offering in his lotus feet. We pay thousands and thousands of obeisances unto his lotus feet.